On 15th October 1895 David Salomons (the Mayor of Tunbridge Wells) with Frederick Simms organised the first British Motor Show named as the Horseless Carriage Exhibition. 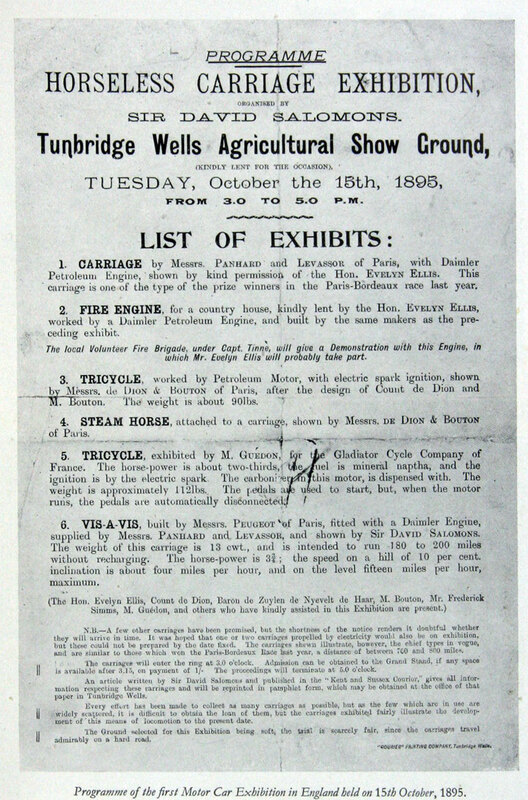 This was held in the Agricultural Show Grounds at Tunbridge Wells. The show had a grand total of five exhibits including two cars, a fire engine, a steam carriage and a tricycle. De Dion steam tractor attached to a landau with the front wheels removed. 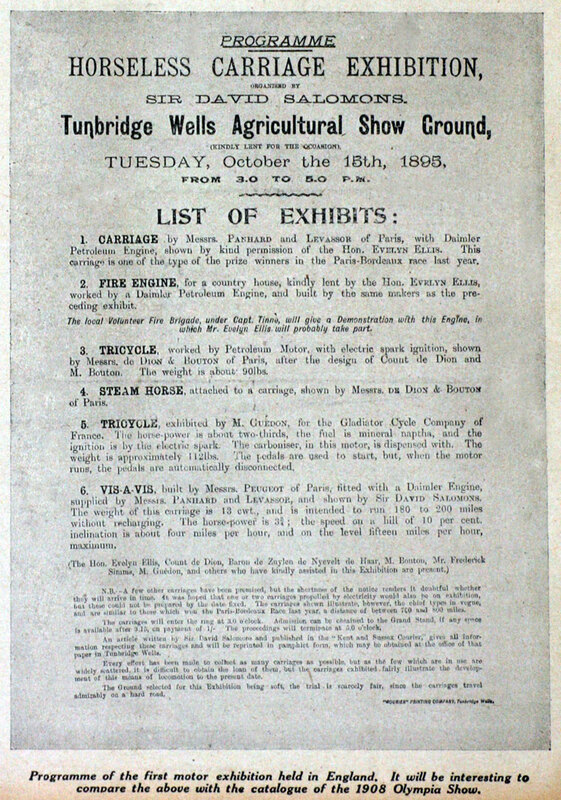 The 1895 Horseless Carriage Exhibition at Tunbridge Wells. When the first assemble of mechanically-driven carriages was held on the Continent it is hard to determine — particularly if the definition of what we now term a Motor Show be held to mean an exhibition exclusively confined to, or mainly composed of, motorcars. If the more rigid definition be adopted, then England was very early, and we must once more ring up that historical occasion, the 15th OF OCTOBER, 1895, when the Pioneer and Father of Motoring in England invited a few Pressmen and prominent people to Tunbridge Wells, of which town he was then Mayor. Need it be said we refer to Sir David Salomons, Bart., himself a distinguished electrician and one of the greatest of living amateur mechanics. Only a few hundreds were present and only five motor vehicles, including the fire engine, fitted with a Daimler engine mounted on a horse-wagon, and the "steam horse," a steam tractor using coke and coal for fuel and making a horrible smell and smoke. Only one of the two motor-tricycles — the De Dion —appeared. The two motorcars were both Panhard-Levassor engined vehicles; horse-carriages converted so as to contain the engines. The first had about 3 h.p. and was the same type as won the Paris-Bordeaux race in 1894. The second car had the high horse-power of 3.75, and 15 m.p.h. was claimed on the flat and 4 m.p.h. up a 1 in 10 hill. Both had tube ignition but is worthy of note the De Dion-Bouton had electric spark ignition — seen for the first time at a motor show. Sir David thoroughly believed in the future of the motor, and, realising the historical importance of the occasion, called for the representative of "The Times" to take the seat beside him as he led the procession. The "Thunderer's" young man was shy, and did not respond, promptly, if at all. The vehicles proceeded round the ground — about a quarter mile to the lap — hilly and grass. So slowly did the vehicles travel that a human-driven tandem carrier outpaced the lot and was ordered off. Later, returning to the town, the motor vehicles showed a better pace on the road, and as they ran down the hill alongside the Common were rattling (literally) along at fully 12 to 14 m.p.h. despite the red flag restriction, then in force. This page was last edited on 20 December 2012, at 07:06.